Small powers often have leverage well above their size and capabilities. North Korea is the example par excellence today: It has a primitive economy by all the usual standards, no reliable trade or security partners, and depends on the outside world for essentials such as fuel and food. Yet by virtue of nuclear weapons and long-range missiles, Pyongyang has the ability to cause consternation among the great powers. That needn’t be the case. Sure, six nuclear weapon tests and frequent tests of intermediate- and intercontinental-range missiles, along with threats to incinerate all enemies, can be jarring. But no one knows better than the North Korean military what use of those weapons would mean for their country: annihilation. They have been living with far more powerful US and allied forces ringing their country for more than half a century. Self- and national preservation are foremost among the aims of North Korean leaders. Thus, they frequently bluster and issue messages of doom, and occasionally attack specific South Korean targets. But they are not so suicidal as to use weapons of mass destruction or fire a missile that would hit US or allied territory. The real purpose of North Korea’s two recent missile tests over Japan is to cause a rupture in relations among the US, China, Japan, and South Korea. Rather than attack Japan, which would galvanize the US-Japan security treaty, these missiles provoke debate in Japan—about US reliability, Japan’s constitutional limitations on taking defensive or offensive action against a threat, and choices of weapons systems (including everything from missile defense to nuclear weapons). All these issues have implications for Japan’s relations with South Korea and China, both of which would strongly protest a major military buildup by Japan and undermine trilateral cooperation in dealing with North Korea (www.nytimes.com/2017/09/15/world/asia/japan-north-korea-missile-defense.html). 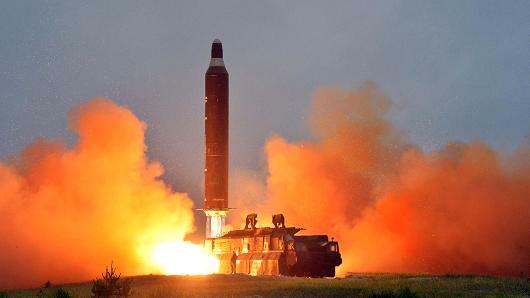 What is particularly interesting from a human-interest point of view about the ongoing debate on how to deal with North Korea’s missiles is that only one of the major players—namely, China—has focused on a diplomatic resolution. All the others are concerned with weapons options. South Korea’s new president has made an about-face and is fully deploying the US THAAD anti-missile system, amidst talk about significantly upgrading the destructive power of its conventional bombs. Japan is apparently considering investing more in missile defense and acquiring cruise missiles. And Washington is (you’ll excuse the expression) trumpeting US weapons sales to both those countries. China, on the other hand, has proposed a “freeze-for-freeze”—North Korea’s suspension of nuclear and missile testing in return for a US-South Korea suspension of military exercises—that might jumpstart talks with North Korea. So far, China’s proposal has found no interest in Washington. In Seoul, the government awaits a positive response from North Korea to a proposal for talks on resuming family reunions and other kinds of contact. But in Pyongyang, only Washington’s behavior counts. The North Koreans take the US seriously as a threat. Negotiating depends on “an end to the hostile policy” of the US, a position North Korea has held since Kim Jong-il’s time and has restated at least three times this summer. We have to ask why that view gets no attention from the Western media, and why US officials consistently and wrongly assert that North Korea has no interest in negotiations. The latest UN Security Council resolution on sanctions includes a call to resume the Six Party Talks on the nuclear issue. It is long past time to craft a diplomatic initiative that is sensitive to North Korea’s security concerns and will test its interest in talking. Interesting third paragraph about North Korea’s motives to cause a rupture in US-China-SK-Japan relations. creates a market in SK and Japan for US missiles, thus good for business? US pressure on South Korea–to the point of calling its new president an appeaser–surely serves the military-industrial complex’s sales. The pressure is also designed to impede any resumption by SK of the “Sunshine” policy. If Kim Jong-un were playing his hand better, he would be responsive to Moon Jae-in’s overtures, but I guess Kim is too busy raising the ante with missiles.